Spring time. Dandelion time. But only for a limited time period. 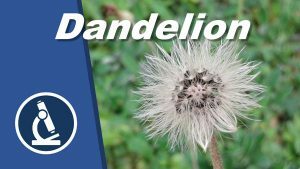 The dandelion produces seeds that are spread by the wind. The “pappus” is the part of the dandelion which carries away the seed. Botanically, it is the fruit of the flower. It is the small chute that makes the seed float away like a feather in the wind. It is this pappus that can be observed easily under the microscope. First you have to remove the seed. It is too thick to be observed. Place a droplet of water on the slide and then place the papas into the water and place a cover glass on top. The pappus is quite large and you can observe it under low power. Dark-field microscopy gives the most beautiful results.